First plans to find a replacement for Canad Inns Stadium came in 2007 and an early vision followed within months. The unique 30,000-seat stadium with two arches touching one another over the pitch was designed by Populous, while local company Raymond S. C. Wan completed the design. In 2009 the venue was approved with numerous amendments. Visually the biggest difference was roof arches going vertically and thus remaining over their respective stands. In May 2010 works began on the University of Manitoba and were expected to end in mid-2012. However, delays caused the opening to be shifter and only take place in late May 2013. Along with time frame changes came financing modifications, with two private partners being left out of the project, funding was left up to Blue Bombers and authorities (local and federal). With an increase in cost over time, the counter stopped at some $ 200 million. Initially nicknamed Project 85, the stadium was later referred to as either the new Bombers Stadium or Winnipeg Stadium. Finally, in 2012 a deal was reached with Investors Group to rename it officially Investors Group Field until 2024. 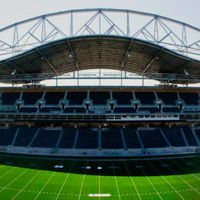 Anchor tenant for the stadium are the Blue Bombers, but two other American football teams are to play here: Manitoba Bisons and Winnipeg Rifles. Also, the association football 2015 Women's World Cup is to be held here, just like numerous concerts and other events. First large event was the religious meeting One Heart on May 26, 2013.